NABLA Cosmetics is an Italian Indie brand which produces quality and trendy makeup products which are supposedly reasonably priced. They are also a vegan and cruelty free brand. 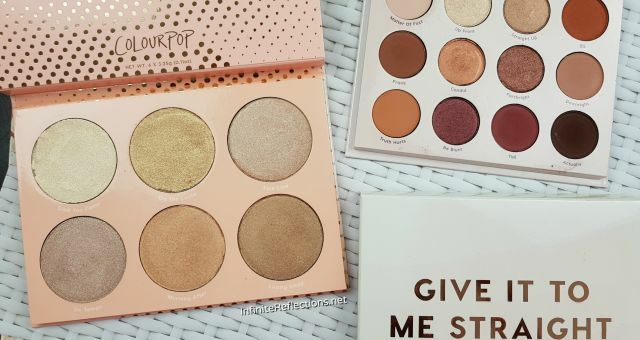 The Dreamy eyeshadow palette was the first product of theirs I came across on the internet and immediately fell in love. After using their products, I am glad to say that I had a great experience and I am always excited to see what are they coming out with next. Which products did I buy from them? 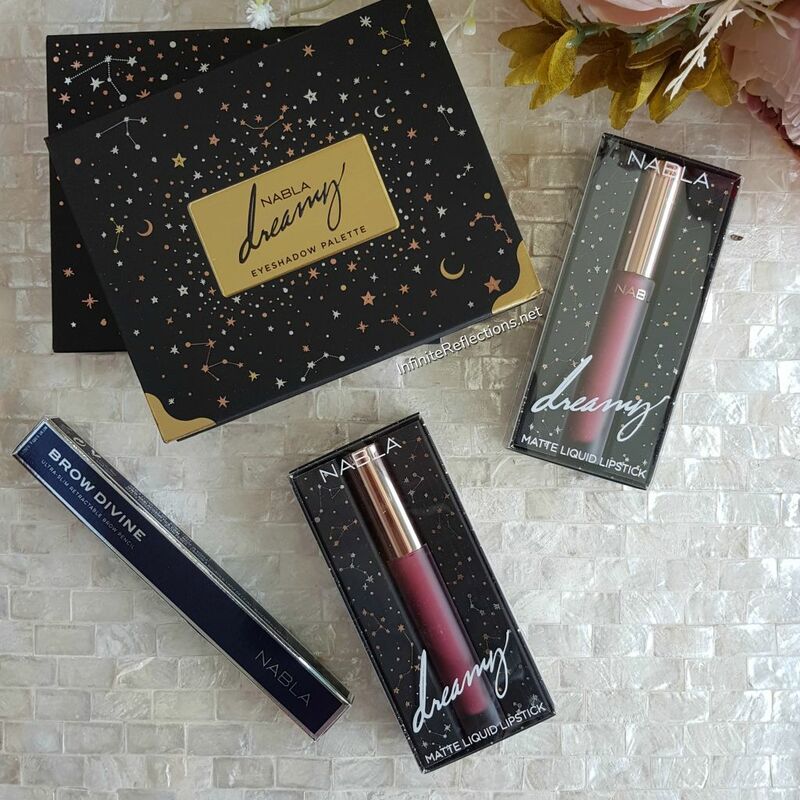 I have purchased the Dreamy eyeshadow palette, Dreamy Matte Liquid Lipsticks and the Brow Divine brow pencil. 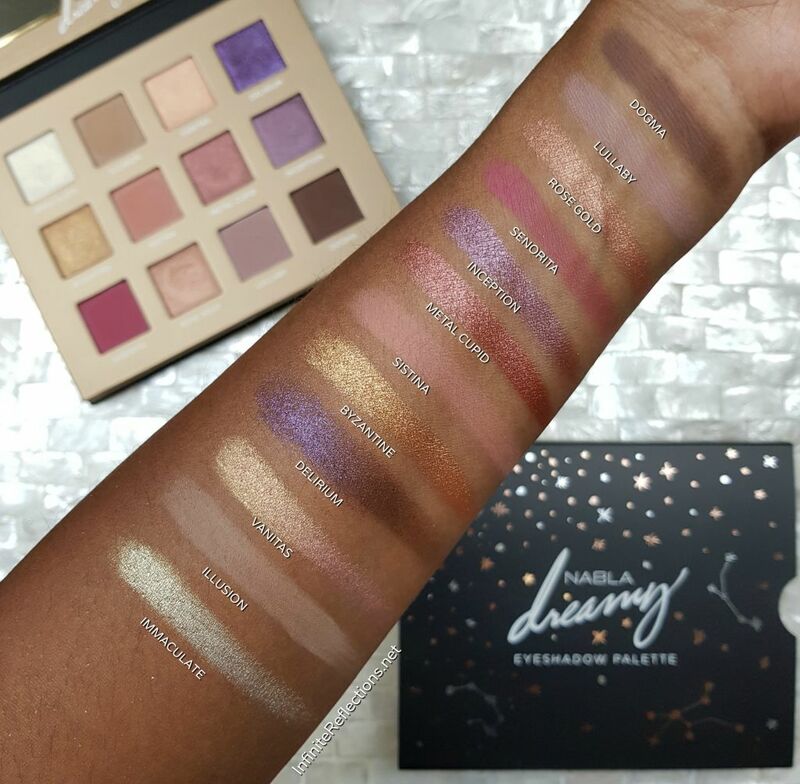 In this post, I am going to review and swatch just the eyeshadow palette and I will post the swatches of the lipsticks and the brow pencil in separate posts. Where did I buy them? Thankfully, Nabla cosmetics is now available on BeautyBay and that’s where I purchased these products from. 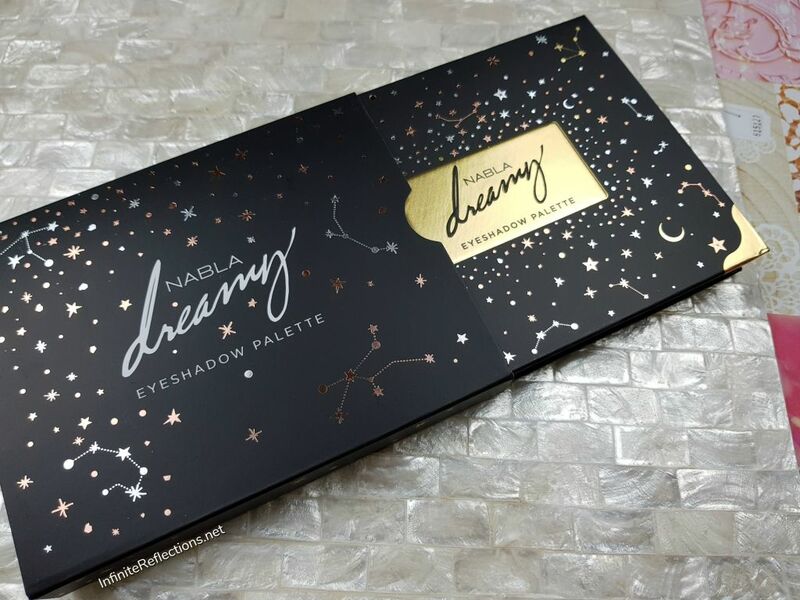 Nabla Cosmetics official website also ships internationally but the shipping cost is higher, so I prefer BeautyBay. How much was the palette for? The company claims that they make products which are reasonably priced but I wouldn’t say that their products fall in the affordable category. The prices of some of their products are pretty high-end. 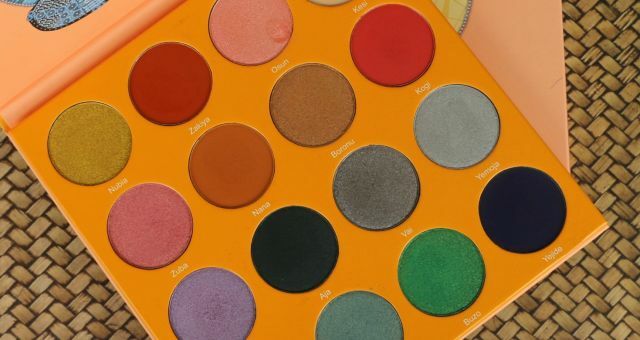 The eyeshadow palette retails SGD 60.90 on the BeautyBay website. Even on the official Nabla Cosmetics website, it retails for EUR 35, which is roughly SGD 55. How much product do we get? 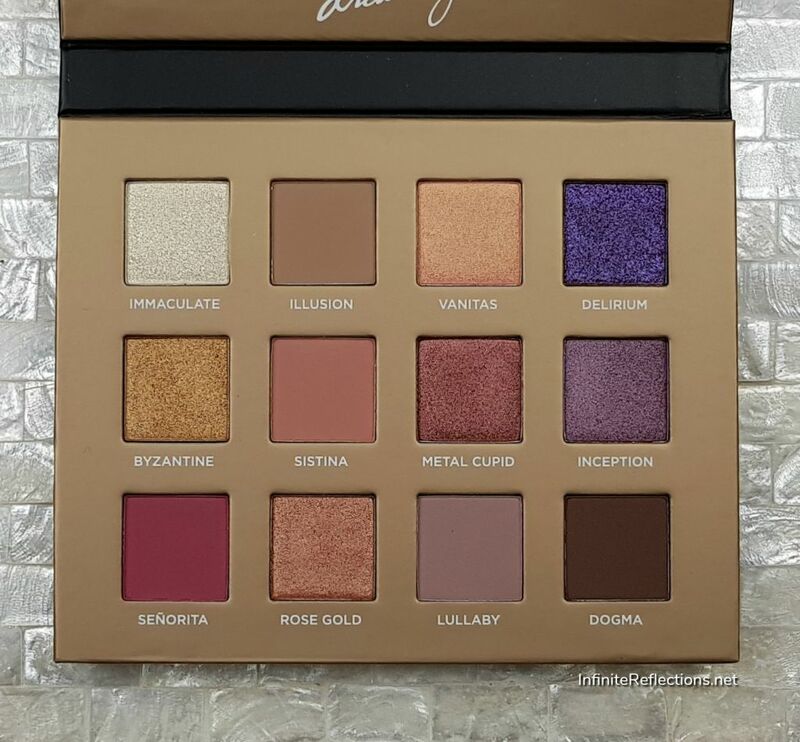 In this eyeshadow palette, there are 12 eyeshadows and each shadow is a little less than 1 gm in the pan. The total shadow quantity is 11 gm / 0.39oz. 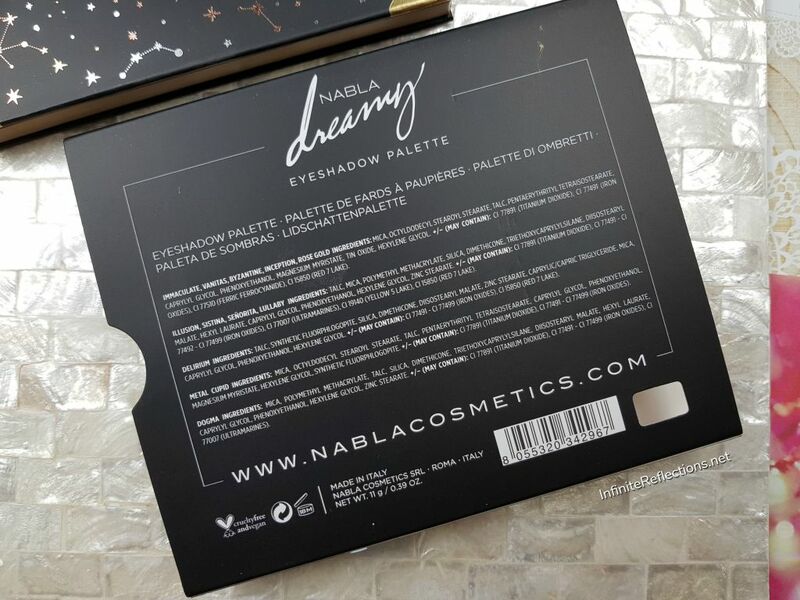 The outer box and the palette mentions the ingredients of all the shadows as in the picture below. How is the packaging? One word, G-O-R-G-E-O-U-S. 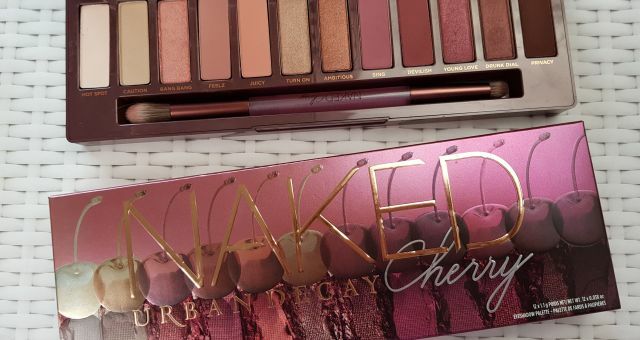 The eyeshadow palette and the liquid lipsticks have the same theme in their packaging. 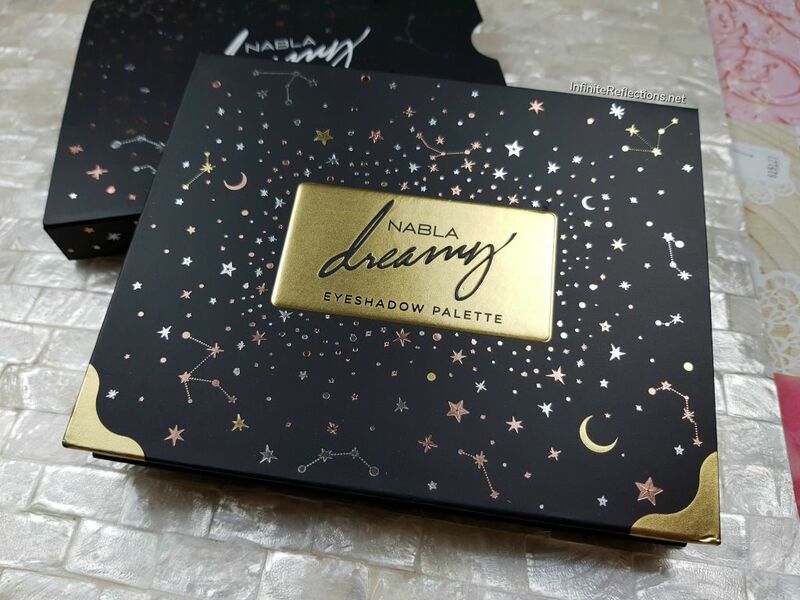 The beautiful matte black cover imprinted with galaxies and stars in contrast with the gold label and golden corners give a beautiful look to the palette. The construction of the palette feels very sturdy. It is made with high quality cardboard and has a magnetic closure. I always prefer cardboard packaging as it is very easy to handle. The cover can be folded all the way back, which makes it very easy to hold and work with. I always appreciate this feature in the packaging of eyeshadow palettes. Palettes which keep closing on me are very annoying. In short, I didn’t find any issue with the packaging. Its sturdy, sleek, compact and very travel friendly. There is also a good quality mirror in the palette. What is the finish of the shadows? 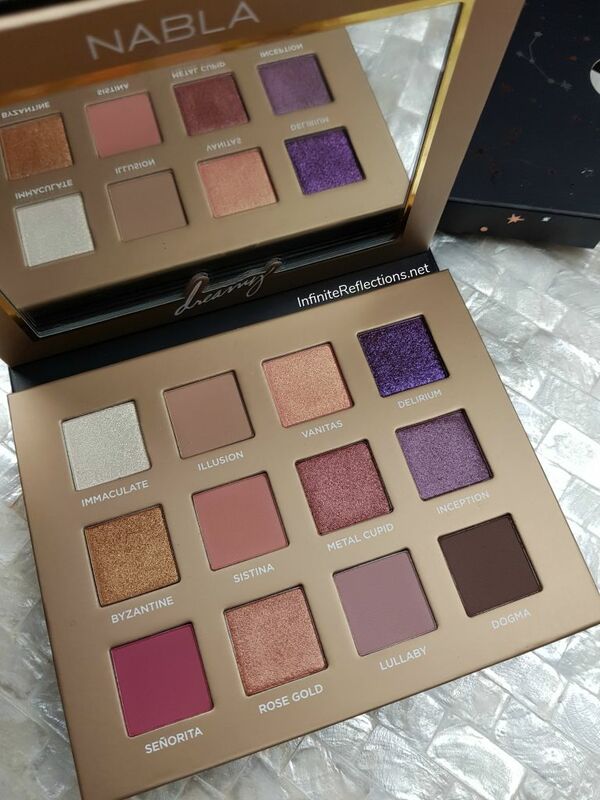 This eyeshadow palette contains intense mattes, foiled shimmers and a glittery shimmer shadow. How was my experience? When I had seen this palette the first time, I knew I would love the colours as this is the colour story I go for most of the time. As a whole, the quality of the shadows is just amazing. The mattes are super soft and buttery, which make them very easy to blend. This also means that there is some fallout, but that’s not a deal breaker for me. They are extremely pigmented and you wouldn’t have to layer too much to get a good colour payoff. Now, the only issue I have with the mattes is that not all of them work well on my skin tone. They have to be built up quite a lot and even then I don’t get a super intense eye look. So, this palette is great to create soft and subtle eye looks, specially if you are close to my skin tone. 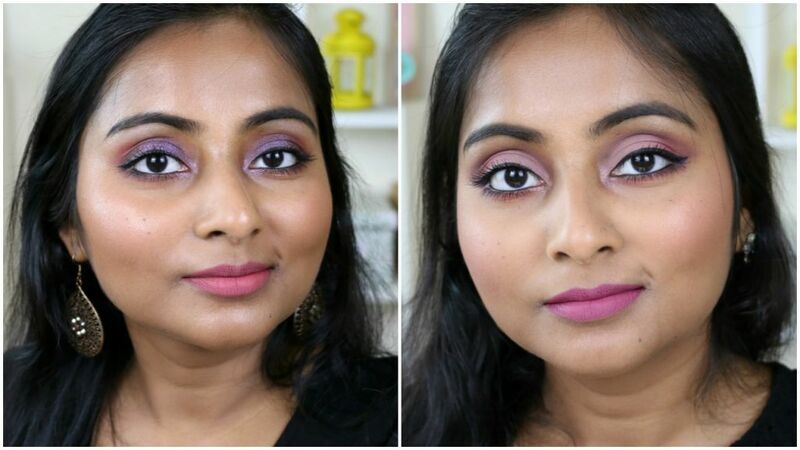 You will be able to create a simple everyday eye look with the mattes in no time. As for the shimmers, the quality is just mind blowing. They are super intense and metallic at one go. They are smooth and buttery with no chunky texture and they apply really smooth on the eyes as well. The shimmers in this palette are the ones which speak to me and the colours are diverse enough in the palette that you will be able to create multiple looks. The only shade which is chunky and have to be worked is the beautiful purple shade called “Delirium”, which is so disappointing. I was really looking forward to that shade. It is more like a pressed glitter shade and needs some effort to be applied, but once applied it looks really pretty on the eyes. I think it will work best with a glitter glue or something, but I don’t any glitter glue to test out. A primer is essential for the shadows of this palette, otherwise they fade away after a few hours. Without a primer they last on my eyelids for about 3 hours, but I have very normal eyelids. On oily eyelids, they made fade away quicker without a primer. Overall, it is an excellent quality palette with a couple of negatives for me. But, I will still recommend this if you are interested in the colours. If you are close to my skin tone, you might have to bring in other palettes for more intensity. But, if I look at the palette objectively, it is a great palette. 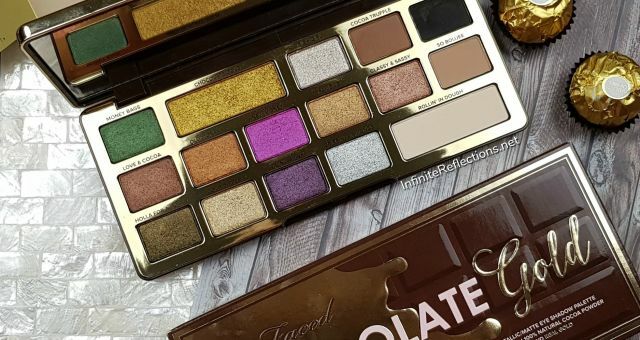 I have done a review of this palette on my channel as well, I will link the video down below. You can watch for further details. Metal Cupid is def one of my faves too.. i also like the light lavender shimmer shade.